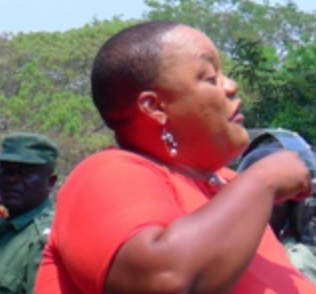 President Edgar Lungu has fired Kafue District Commissioner Charity Ngulube and replaced her with one of his long time ‘sweeties’ Charity Banda. Lungu has also replaced Lusaka District Commissioner Ashwell Kampengele with a captain Mulenga, the Watchdog has been informed. The new DC for Kafue (in the photo) is believed to be a very close companion of president Lungu. She is the same PF official who has been harassing airport staff when Lungu is at the airport. When Lungu was returning from Ethiopia last week, Lungu’s companion cause a scene when she found that some of her colleagues were not allowed intio restricted areas of the airport. “Pantu tachawame, indeke nga yafika isange tatulaingila, ifintu ni Lungu. Kanshi, ninshi problem? Na Airport yonse kanshi tukachite take over. This is very useless indeed (the situation will turn ugly if the plane arrives before we enter. What is the problem? We will take over this airport then) ,” Banda was heard telling airport security officers. And when Lungu and his public wife were going to Mfuwe, the same Charity Banda, chased PF chairperson for international relations Longa Chibesakunda from the airport apron. “Mwe ma officials nde fwaya munjebeko uwapela uyu inchito. Pantu alitubutwike inshita ya ma campaign uyu. Ndefwaya munjebeko ifyo alecita kuno (Can you the officials tell me who gave this man a job because this man ran away from us during campaigns. I want to to know what he is doing here),” Banda said. “Mwe bali apa bushe ninshi tamulefwayo inchito imwe? Mulefwaya abantu abashale campaigner bamipoke amachito? Njebeni. Pantu uyu tapali uwalamusuminishya ukumona ba President (Are you people who are here not interested in jobs? Do you want those people who never campaigned to get your jobs? So no one will allow this man to see the President).” Chibesakunda was forced to leave the airport apron before the President arrived for fear of being harassed.